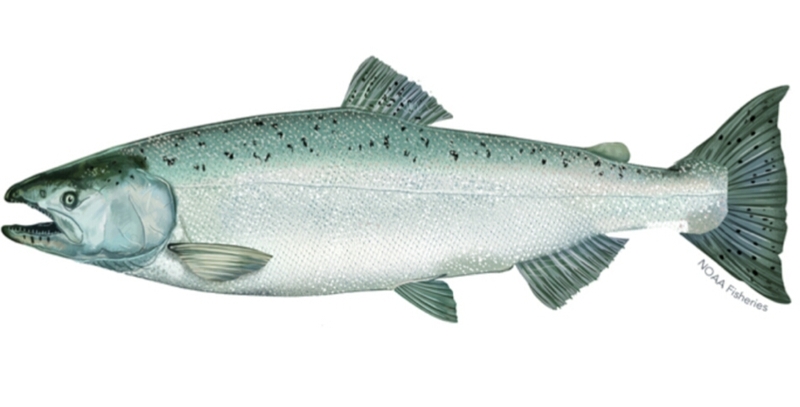 The National Marine Fisheries Service (NMFS) has included the Sacramento River Winter-Run Chinook Salmon in its “Species in the Spotlight,”1 one of the eight species under NMFS’s jurisdiction nationwide that are most at risk of extinction. The most serious threat to Winter Run and the major cause of the nearly complete loss of the past two years’ production relates to the first item in the above list: improving management of Shasta Reservoir cold water storage is essential. The change from a 58°F daily-average water temperature standard at Redding (last summer) to 53°F as proposed by NMFS will greatly help by alleviating sporadic lethal conditions that occurred last summer (Figures 1 and 2). Achieving non-lethal conditions through the summer is possible by conserving Shasta Reservoir’s cold-water pool, which is best achieved by reducing inputs of warm water from Whiskeytown Reservoir (from Lewiston-Trinity reservoirs) into Keswick Reservoir via the Spring Creek Powerhouse (Figure 3). This source of warm water made up about 15% of the release to the Sacramento River from Keswick Reservoir, and required use of extra Shasta’s cold-water pool water to meet the relaxed temperature standard of 58°F in the upper Sacramento River below Keswick in Redding. Another source of warm water to Keswick Reservoir was from daily afternoon peak power releases from Shasta Dam (Figure 4). High releases in afternoons raised water temperatures in Keswick Reservoir, requiring more cold-water pool release to compensate for warm water inputs. Apparently, the operations were too complicated for Reclamation to maintain the required 58°F average daily temperature at the mouth of Clear Creek (CCR gage: Figure 1). Operations at other times (e.g., first week in August) indicate clearly that Reclamation had the capability of keeping the water temperature well below lethal levels. Figure 1. Lethal water temperature extremes for salmon eggs and fry (red circles) near Redding in summer 2015. Green circles denote non-lethal conditions that can be maintained with proper management of Shasta’s cold-water pool. Figure 2. 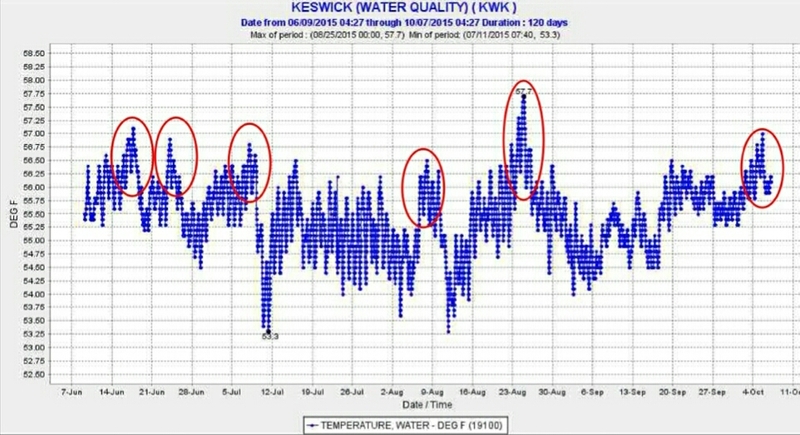 Episodes of high water temperature in Keswick Reservoir (red circles) in summer 2015. Peaks were due to hydropower peaking and specific operations of the Shasta Temperature Control Intake Tower to powerhouses at Shasta Dam. Figure 3. 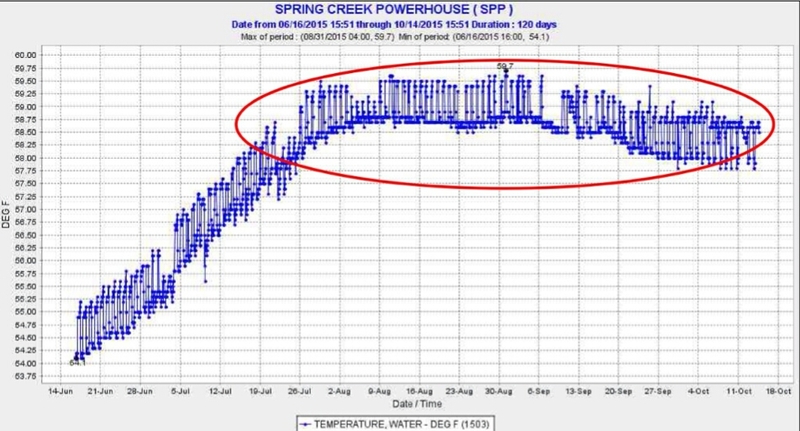 Warm water (red circle) entering Keswick Reservoir from Whiskeytown Reservoir via Spring Creek Powerhouse in summer 2015. Daily range of 1°F is due to hydropeaking operations. Figure 4. 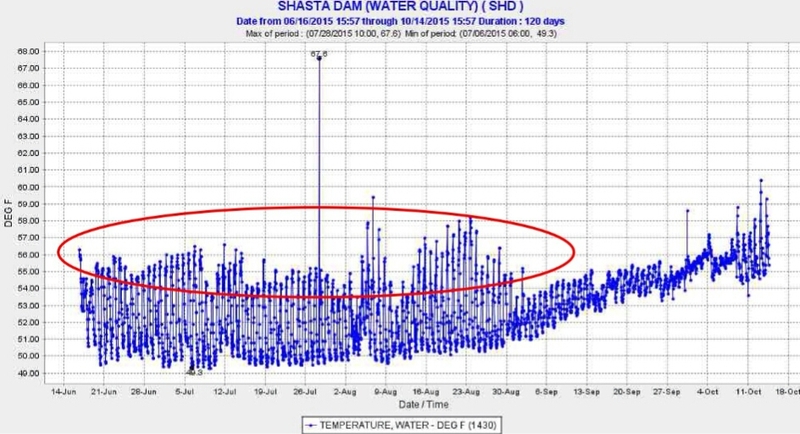 Warm water releases (red circle) from Shasta Reservoir during daily hydropeaking operations in summer 2015. Release water temperatures in the first week of August and September were lower because of lower afternoon hydropower peaking releases of warm water along with more night-morning cold water pool releases. In my March 12 post, I related that Senator Feinstein’s request for higher Delta exports would put the Delta Smelt population in the Delta at further risk of extinction. Well, she received her wish, and exports increased from 6000 cfs to 8000 cfs (11,400 cfs is maximum pumping capacity) in the week after her request when storms brought more inflow to Delta from the San Joaquin River. However, the higher exports were short–lived, because the 3/14-3/17 Smelt Larvae Survey picked up larval smelt for the first time this year (Figure 1 – green dots). Exports dropped below 5000 cfs again. Though only two newly hatched larvae were collected in the central Delta, their presence is a concern. 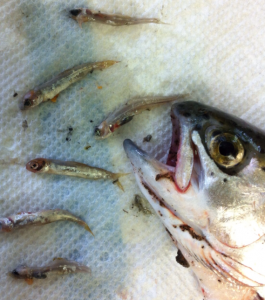 The presence of larval smelt shows that smelt are spawning in the lower San Joaquin River in the central Delta. According to the Smelt Working Group the net negative flows shown in red in Figure 1 for late March indicate a “medium” risk to smelt and a likelihood that larval smelt will be drawn toward the south Delta export pumps.1 The -5000 cfs Old and Middle River (OMR) reverse flows are the maximum allowed under the Smelt Biological Opinion. In its review of the results of particle tracking model runs, the Smelt Working Group concluded: “Members stressed the importance of weighing more heavily the results from inserting (particles) at Prisoner’s Point, given the consistent catch of adults there this year and the hydrologic proximity of that location to the south Delta (as compared to Jersey Point). 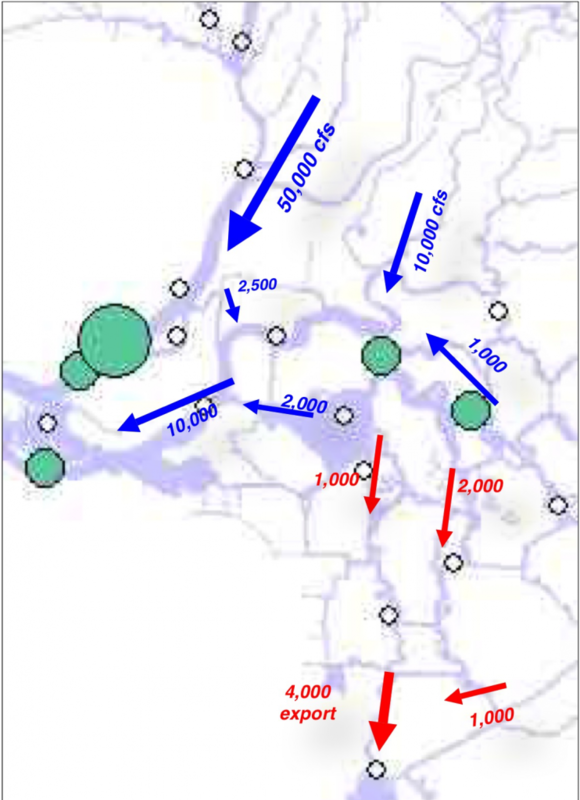 For OMR flow of -5000 cfs, approximately 20% of the particles inserted at Prisoners Point were entrained into the South Delta. For an OMR flow of -2500 cfs, approximately 10% of particles inserted at Prisoners Point were entrained into the South Delta. For an OMR flow of – 1250 cfs, less than 10% of particles inserted at Prisoners Point were entrained into the South Delta.” Prisoners Point is the green dot from the right on the Figure 1 map. In all likelihood, larval smelt are now being drawn or will soon be drawn into the south Delta. It is too early to determine what portion of the population is subject to this risk. But given the unprecedented depressed condition of the smelt population after four years of drought, the risk is significant. On March 24, after review of “Smelt Working Group’s March 21 recommendations,2 the U.S. 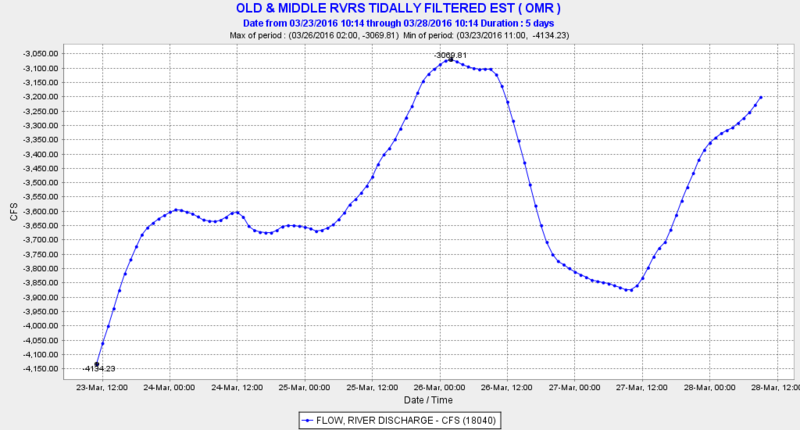 Fish and Wildlife Service “determined”3 that the OMR should be no more negative than -2500 cfs on a 14-day average, and no more negative than -3150 cfs on a five-day average. Reclamation took a slightly more liberal interpretation in the subsequent week’s operations (Figure 2), staying nearer -3500 cfs most of the week with no apparent interest in reaching a -2500 cfs 14-day average. It could be that the Service meant to recommend a -3500 cfs OMR limit. Or maybe the Service got a call from Senator Feinstein’s office. We shall see what this week’s meetings and determinations offer. In any event, the risk to Delta Smelt remains “medium” at combined exports of about 3500-4000 cfs. 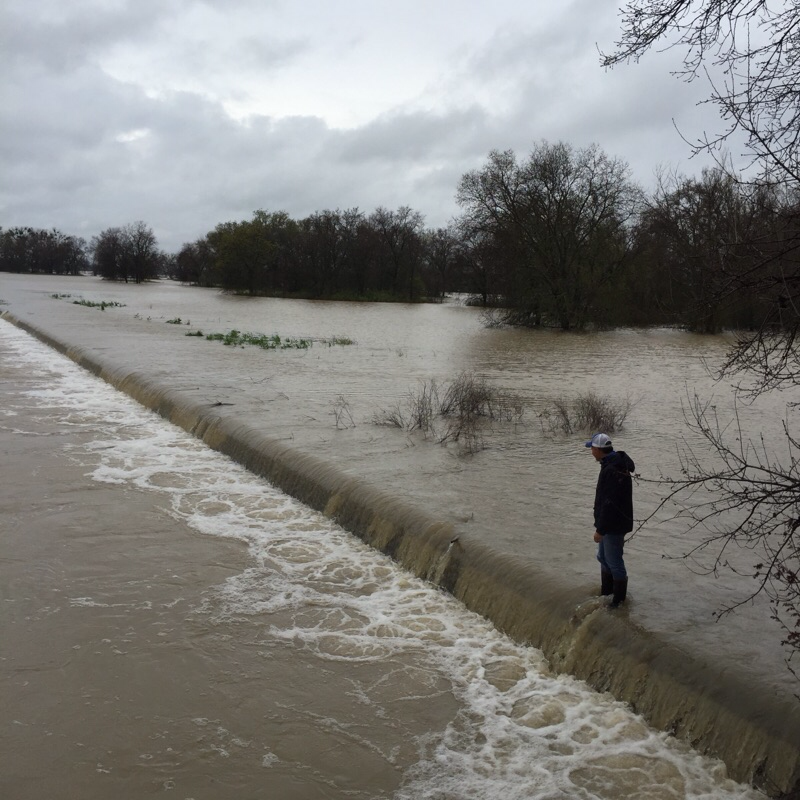 With an export capacity of 11,400 cfs, Delta outflow still exceeding 50,000 cfs, reservoirs continuing to release snowmelt, and San Luis Reservoir in the San Joaquin Valley only half full, there will be continued cry for more exports and for approval of the Tunnels. In the meantime, it appears from Figure 1 that some smelt larvae and a good amount of snowmelt are escaping west to Suisun Bay, while some larval smelt remain at risk in the central Delta. Figure 1. Net daily flow in Delta in late-March 2016. (Gage data source: USGS). Green dots are location of seven Delta Smelt larvae collected in Survey 6 of Smelt Larvae Survey (http://www.dfg.ca.gov/delta/data/sls/CPUE_Map.asp ). It is one of those wet springs when the Sacramento River has spilled over the Fremont Weir at the upstream (north) entrance to the Yolo Bypass near Verona. In a January post I summarized the need to fix salmon and sturgeon passage at the weir. 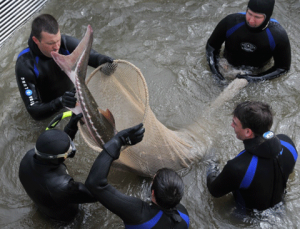 In early April 2011 adult sturgeon and salmon were rescued at Tisdale and Fremont weirs1 under nearly the same circumstances that have developed since mid-March this year. 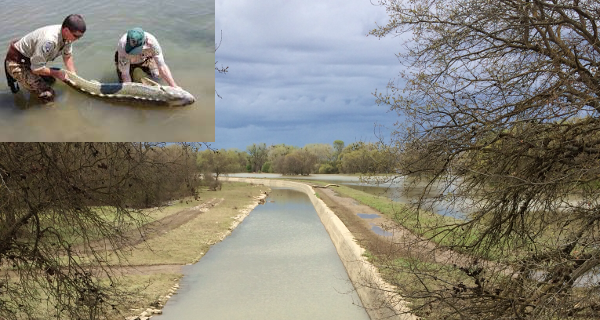 In the coming weeks, many adult sturgeon and Winter Run salmon attracted by the high Bypass flows will again show up and become stranded at the Fremont Weir as the weir ceases to overflow. River levels are expected to drop as much as eight feet in the coming week. As the Bypass slowly drains in the coming days more and more salmon and sturgeon will migrate up the Bypass via Cache Slough near Rio Vista. Many will become stranded in the upper Bypass as far up as the Fremont Weir concrete apron, where rescues occurred in the past. Others will make their way to the west side of the upper Bypass to outlet of the Knights Landing Ridge Cut (KLRC), and migrate up into the Colusa Basin via the Colusa Basin Drain where they will be lost. In spring 2013, many Winter Run salmon were found stranded in the Colusa Basin under similar circumstances. The peak migration of Winter Run and sturgeon is in March and April. So I expect many salmon have or will be headed up the Ridge Cut, which is flowing 500-600 cfs.2 The CDFW trap is removed from the Ridge Cut outlet at such high flows. In the meantime, trapping and rescues are the only measures to save fish again this year. These efforts should start soon. 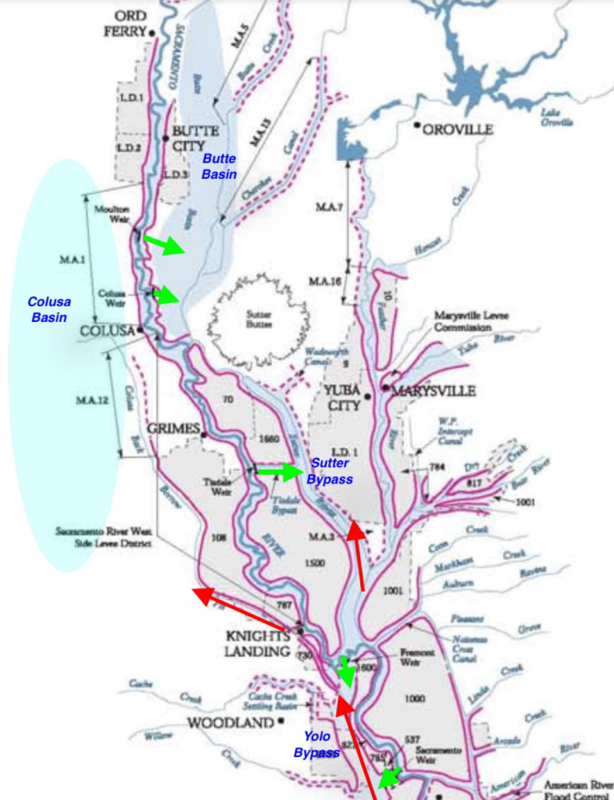 Note similar problems occur at the Moulton, Colusa, and Tisdale weirs (see map and last photo). Above Photo: Fremont Weir on March 13, 2016. 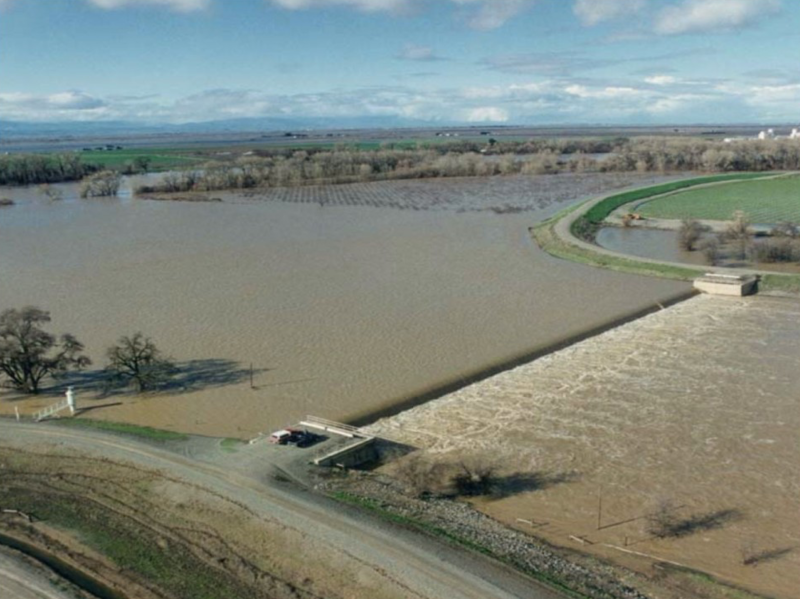 Overflow to Yolo Bypass was 30,000-40,000 cfs. Overflow peaked at 65,000 cfs two days later, as river stage rose to 36 ft, two feet above that in photo. For video of overflow event and Bypass flooding see http://youtu.be/9hrn2bSgg8A . Above Photo: Fremont Weir on March 20, 2016 when overflow temporarily ceased at river stage dropped to 33.5 ft. Insert: 2011 rescue photo. Above photo: Moulton Weir in January 1997. FISHBIO Strikes Again – Predation Is the Problem, Not Water Diversions – Right or Wrong? On Wednesday, February 10, 2016, the Water, Power and Oceans Subcommittee held a one-panel oversight hearing on “The Costly Impacts of Predation and Conflicting Federal Statutes on Native and Endangered Fish Species.” FISHBIO President Doug Demko was invited to provide testimony on the issue in reference to California’s Central Valley. Failure to protect native and endangered fish species in the Central Valley has far more to do with water management within the federal Central Valley Project and State Water Project and lack of protections from water quality standards and biological opinions, especially during four multi-year droughts beginning in the late-1970’s. Over a billion dollars have been spent by federal and state agencies on fish recovery, with strongly positive results between droughts. In no way have the recovery efforts bolstered introduced top-level predators such as the striped bass. As noted in the testimony, stocking of striped bass ceased nearly two decades ago. Striped bass production had declined dramatically over the past three decades along with the native fish. Summer water quality standards that once protected striped bass were removed twenty years ago. The increases in stocking of hatchery salmon smolts to over 30 million annually in the Central Valley have encouraged and sustained the remaining striped bass, which now focus more on young salmon. Adult striped bass now concentrate in spring below all the Central Valley salmon hatcheries and dams. Remnants of the once prolific striped bass population await the fat hatchery smolts in all 300 miles to the Golden Gate. A shift in prey and location of prey has forced more Striped Bass into the rivers and tributaries for prey. Research has shown that habitat changes have had more to do with increased predator populations like largemouth bass in the Delta. Controlling habitat change is the proven way to limit predators, rather than direct control of predators, which does not work (logistically impossible and very costly and inefficient). “However, only recently has the existing body of science on predation been recognized among fisheries managers as a major source of juvenile salmon mortality.” This statement is simply not true. Hatchery salmon smolts have been trucked to the Bay for three decades to avoid the hundreds of miles of predator gauntlet. Predation studies at specific locations such as the Red Bluff Diversion Dam have long indicated predation problems. The dam was removed because it was a recognized predator “hot spot”. There is no doubt that predation by non-native fish like Striped Bass and Largemouth Bass is a major factor in Chinook Salmon and Steelhead mortality in the Central Valley. However singling them out as the primary cause of native fish declines misses the key factor: water management. Salmon, smelt, and bass got along well until the State Water Project came on line in the 1970s and increased Delta exports from 2 million to 6 million acre-feet per year. There is no doubt that droughts and climate change have added to or sped up changes; however the underlying problem remains water diversions. “It has now become clear that predation may significantly limit the success of salmon recovery efforts (NMFS 2009b; Dauble et al., 2010).” While this statement may be true under existing conditions where salmon production is limited by water management and habitat degradation (with predation exacerbated by these factors), the solution should be a broader range of risk factor management, not just a focus on predation. For example, spring reservoir releases can reduce predation risk by speeding emigration, increasing turbidity, and reducing water temperature. “[N]o changes in sportfishing regulations, and, to date, no meaningful actions of any kind have been taken to accept or address the problem.” Changing sport fishing regulations would be a drop in the bucket and alienate most sport fishermen. Why doesn’t CDFW take the hundreds of thousands of young striped bass salvaged each summer at the Delta export pumps (and returned to the west Delta) and stock them in a southern California reservoir? Because that would cripple the Bay-Delta striper fishery – an angler’s Catch-22. Why doesn’t CDFW take the catch from hundreds of bass tournaments each year in the Delta somewhere other than nice spots in the Delta? Because that would cripple the world-renowned bass fishery – another Catch-22. FishBio describes the bounty fishery on Columbia River predators that are less desired as gamefish. It is altogether different to put a bounty on Striped Bass and Largemouth Bass. FishBio noted that harvest restrictions on non-native sport fish have recently been removed on the Columbia River to protect native salmonids. “A similar policy change in California, coupled with focused removal and suppression efforts, could lead to improved survival conditions for native species as has been demonstrated on the Columbia River.” Columbia River salmonid fisheries are far more valuable and popular than bass and walleye fisheries. Furthermore, there is little else managers can do on the Columbia to benefit salmon. Water diversions in the Columbia are far less of a problem, and managers on the Columbia have already severely limited hydropower production to provide spring spills for salmon. These actions have brought record or near record salmon and steelhead runs. In conclusion, Striped Bass and Largemouth Bass are two of the top sportfish in the Central Valley. Destroying their populations and sport fisheries, and associated socio-economic benefits, without addressing water management, the real culprit, will not solve or defuse the problem. Winter Run Salmon have taken the Brunt of Punishment from Reclamation’s Shasta-Trinity Drought Operations – what about 2016? In the last two summers, Winter Run salmon production was greatly reduced by Reclamation’s operations of the Shasta-Trinity Division of the Central Valley Project. While the drought brought on the problem and the specific damaging project operations, the damage done was in large part unnecessary. Furthermore, not all the blame should go to Reclamation – the State Water Board and resource agencies who condoned the damaging operations also deserve some of the dis-credit. I wrote on the subject in some detail in November.1 Resource and management agencies who were responsible for the failure of two year classes of Winter Run continue to blame the drought or demands of water contractors on Shasta-Trinity storage (Figure 1). Soon they will prepare a plan for the coming irrigation season. The plan will depend greatly on present and coming late-winter weather and hydrology. Given that Shasta Reservoir likely will fill this spring, the plan will likely revert to operations similar to those of 2011 and 2012, the last two years when the reservoir filled. Figure 1. NMFS blames the drought. “With the loss of two out of three cohorts of endangered wild winter-run Chinook salmon (2014 and 2015), it is critical that we develop cold water pool resources in the winter and spring to support temperature management needed later in the year for this third wild winter run Chinook salmon year class.” Comment: irrigation deliveries to Sacramento River Settlement Contractors in April and May of the last two years were a major cause of the loss of the cold-water pool in Shasta. This in turn led to high egg mortality in the upper Sacramento River just below Shasta. While cutting the April and May deliveries would have alleviated the greater part of the problem in both years, it is not all of the problem or solution. Operational changes in the Shasta-Trinity Division could have eliminated many of the problems with little impact to irrigation deliveries, at least in 2015. 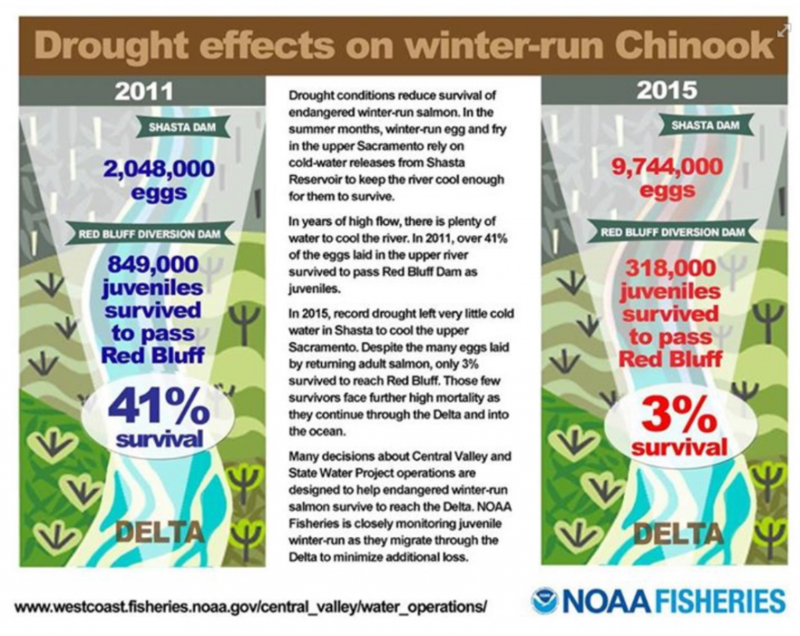 “These data reflect a 97.9% mortality of winter-run Chinook salmon eggs and fry on the upper Sacramento River in 2015.” Comment: Yes, the excessive water temperatures allowed by the State Board by relaxing their water quality standards caused the nearly complete loss of 2015 Winter Run production. “Shasta operations: Implementation and Exception Procedures for End of September (EOS) Storage of 1.9 MAF or below – As per RPA Action I.2.2.C, if the EOS storage is at or below 1.9 MAF, then Keswick releases shall be managed to improve storage and maintained at 3,250 cfs unless hydrology improves.” Comment: Hydrology in the Central Valley has greatly improved with El Niño, yet releases were kept at 3250 cfs all winter, to the further detriment of the Winter Run, and were only increased well after Shasta exceeded the reservoir level at which Reclamation is supposed to release water to protect against floods. Young salmon need flow pulses to successfully migrate downstream from spawning and rearing areas. “Given the substantial mortality of Sacramento River winter-run Chinook during the egg incubation and emergence periods in BYs 2014 and 2015, there is a need to conservatively manage for protection of the third of three winter-run Chinook cohorts, which will return to spawn upper Sacramento River beginning in summer of 2016. In the coming months, Reclamation and NMFS will be evaluating different actions to balance fishery needs, water supply, and water quality to develop a greater likelihood of protecting juvenile winter-run from BY 2016. As mentioned previously, any proposed action will require the cooperation of senior water rights holders on the Sacramento River and a system-wide operational approach to prioritize cold-water storage and operations at Shasta Lake.” Comment: After the failures in 2014 and 2015, we await the final plan for 2016. “Under any hydrologic exceedence scenarios, there is a need to maximize water storage in Lake Shasta to comply with the December 15, 2015 adopted Order and also increase the likelihood of successfully implementing a water temperature management plan to benefit winter run Chinook salmon. The NMFS has prepared some initial concepts to achieve storage and temperature goals (Attachment 4) (Figure 2). In general, the proposed concept involves flow release as low as 2750 and 3250 until late May or initiation of a water temperature management plan.” Comment: The suggested NMFS improvements (“2016 adjustment”) would be a great benefit, particularly the 53°F DAT (daily average temperature) at Clear Creek in Redding (CCR). Obviously, 53°F would be a substantial improvement over last year’s allowed 58°F. The change is reasonably conservative given the present state of the population. The 55°F 7-day average daily maximum option leaves too much room for error, such as a day of lethal temperatures. Given the circumstances, we can only hope that NMFS recommends the more conservative approach, as it will also greatly help downstream habitat conditions at Balls Ferry and Jellys Ferry, which would further benefit Winter Run. Figure 2. 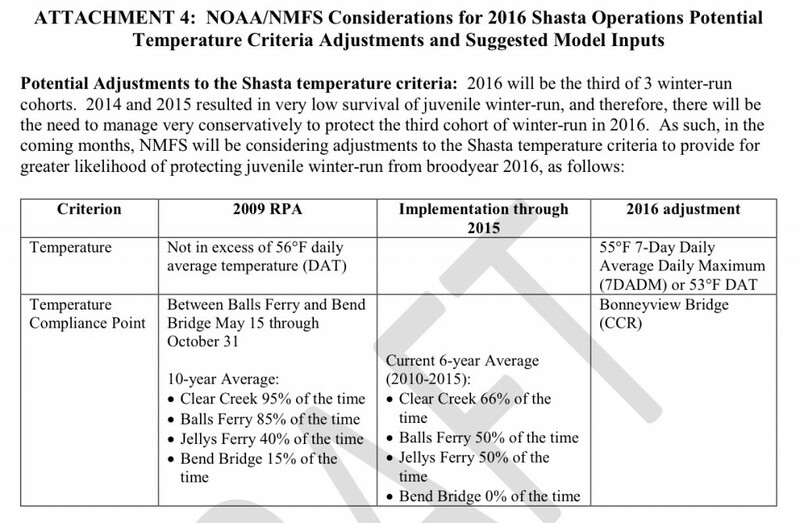 NMFS considerations for the coming summer water temperature standard in the Sacramento River near Redding. Nearly half way through the water year it is safe to say there is a very reasonable chance there will be adequate water resources to save the Winter Run salmon this year. 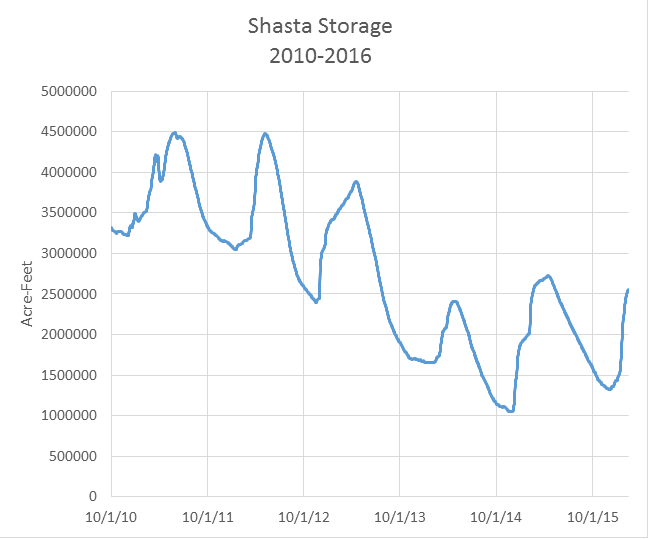 Shasta storage is sharply rising (Figure 3). The reservoir will likely fill this spring for the first time since 2012. The snow pack is also above average. Maximum daily average water temperature in Keswick Reservoir release – 53F. 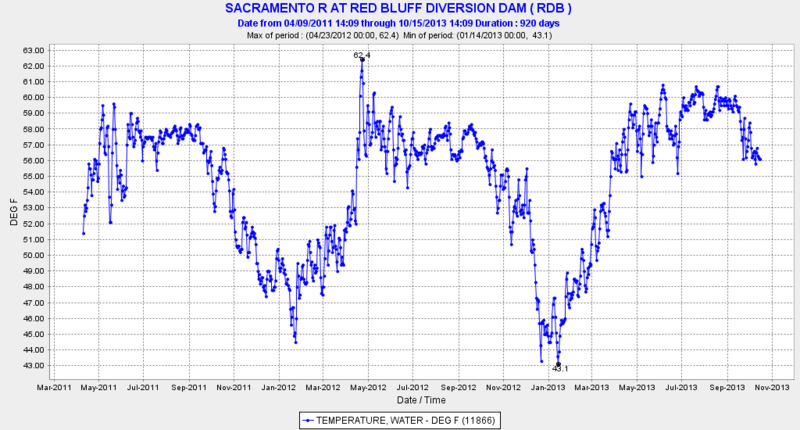 Maximum daily average water temperature at Red Bluff – 58F. Both these criteria were achieved in 2011 and 2012 (Figures 4 and 5), the last two years when Shasta Reservoir filled. Figure 4. 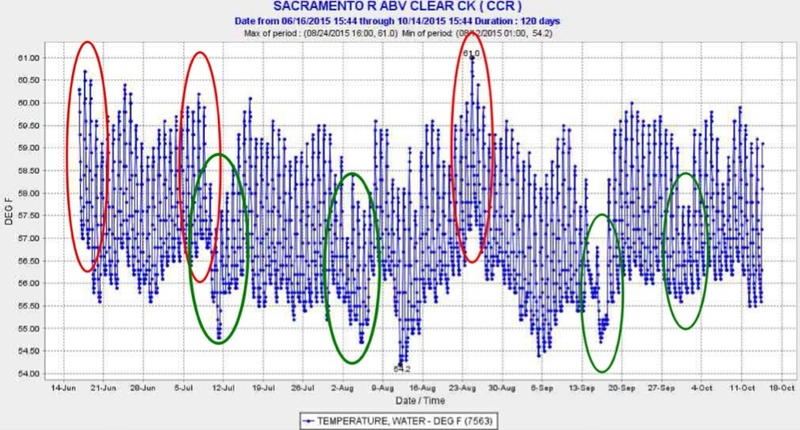 Water temperature (daily average) in Sacramento River at Red Bluff – April 2011 to November 2013. Figure 5. 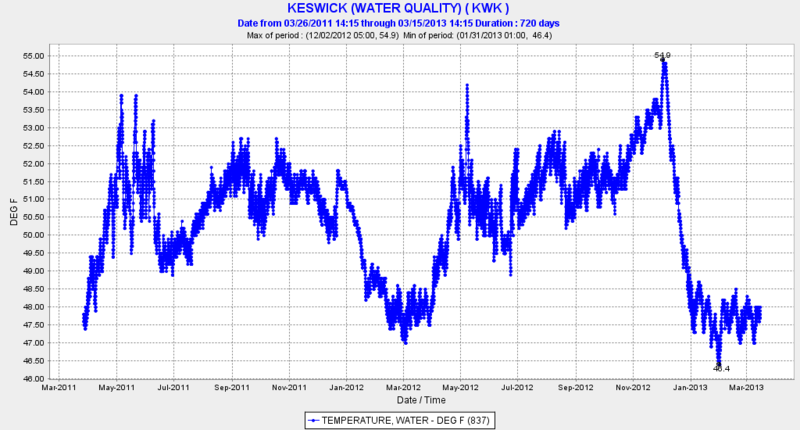 Daily average water temperature of Keswick Reservoir release – April 2011 to March 2013.